The purpose of this current study is to assess the differences between quality-rating scores, calculated by data analytics companies for a pharmacy within a practice-based research network. This study is a retrospective service utilization review of randomly selected chain and independent pharmacies from a multistate, practice-based research network. In November 2015, we conducted a chart audit of quality metric data from all data analytics companies at each pharmacy. All data from each data analytics company were collected on the same day, minutes apart, simulating real-world experience of the data. The pharmacies were all part of the same buying group, which provided consistency within the data analytics companies used. Data collected included the quality metrics measured, the number of patients in each measure, the value of the quality measures, and demographic data (Table 1). The Samford University Institutional Review Board approved this research. Statistical analysis was conducted using SPSS Statistics for Windows, version 19.0, with a 1-way analysis of variance test for the independent, continuous, multiple samples data; pharmacy demographic data were defined by descriptive statistics. The majority (78.5%) of pharmacies within the network had a weekly average of between 1400 and 1700 prescriptions dispensed, 1 pharmacist working (71.4%), an urban setting (71.4%), and trained interns or externs (85.7%). A detailed breakdown of the demographic data is outlined in Table 1. The analysis of variance within pharmacy measures was statistically significant for each quality measure (Table 2). Each pharmacy had access to 3 different data analytic systems, and each system (Systems A, B, and C) within Table 2 represents a different company; proprietary names were removed during the deidentification process for the researchers. Of all the variations between the 3 systems and the different measures, only patients receiving high-risk medications, and the percentage of patients receiving a high-risk medication, were identical within System B and System C—348 patients and 11.6% of patients receiving a high-risk medication, respectively. The only other discernible pattern was that System A provided the highest mean each time compared with Systems B and C, but it had the lowest number of patients included in the measure. For example, in the adherence to oral antidiabetes medication measure, the mean number of patients adhering to antidiabetes medication in Systems A, B, and C was 18, 102, and 43, respectively. In addition, the mean percentage of patients considered adherent to the diabetes medication in Systems A, B, and C was 82.8%, 75.6%, and 82.5%, respectively. In this measure, System A had the smallest number of patients but the highest rate of adherence. 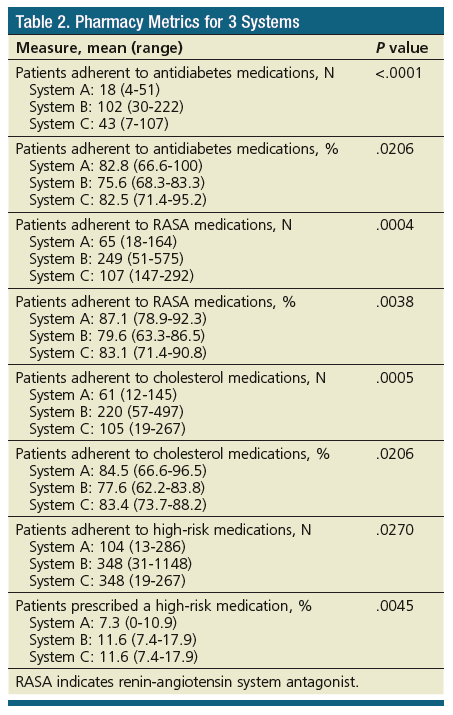 The pattern of System A having the least number of patients in the measure and the highest value of quality—defined as number of patients adherent—is consistent within all 3 adherence measures. The results show that the measurement of quality care is dependent on the data analytics company, and that results are variable. 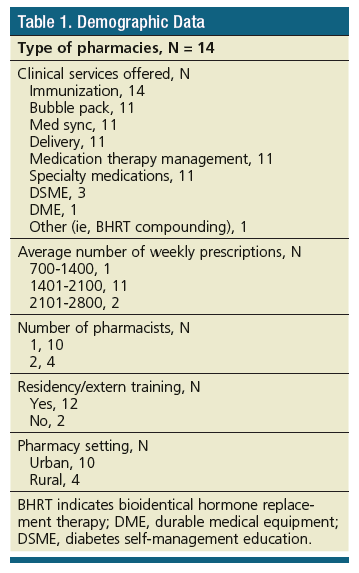 A push toward higher-quality care in healthcare is warranted and encouraged; however, this study shows a large discrepancy in how community pharmacies are measured. Finally, many of the PQA-developed quality measures are dependent on medical diagnosis codes; that is, International Statistical Classification of Diseases, 9th Edition (ICD-9) or ICD-10.12 Because prescription claims data do not contain diagnosis codes, a data analytics company must have an established relationship with the insurer to link the data points and provide the true measure value. Discrepancies within the measures, specifically the number of patients, could arise because of the “disconnect” between prescription claims data and medical claims data; for example, a patient with a medical exclusion (eg, hospice care) may be excluded based on the PQA measure, but a data analytics company examining the pharmacy data is unaware of this exclusion. Based on the results of this study, it is important that a standardized method for measuring the quality of community pharmacies is developed to ensure that patients are receiving optimal healthcare. The PQA was developed as a multistakeholder organization to develop and validate quality measures.13 All data analytics companies should therefore license the quality measures developed by the PQA to standardize the measurement process. Once all data analytics companies use the same methodology for quality measures, further research will be warranted to ascertain the extent to which quality measures designed for health plans correlate with community pharmacy outcomes. Dr Galdo is Speaker for Novo Nordisk, Co-Chair for the Pharmacy Quality Alliance (PQA) Patient and Caregiver Advisory Panel, PQA Ambassador, and member of the Measurement Update Panel; Dr Freeman is PQA Ambassador; Dr Blackwood has nothing to disclose. Pharmacy Quality Alliance. PQA measures used by CMS in the star ratings. 2016. http://pqaalliance.org/measures/cms.asp. Accessed July 12, 2016. Prescribe Wellness. Frequently asked questions. 2016. www.prescribewellness.com/business/faq. Accessed July 12, 2016. Prescribe Wellness. StarWellness. 2016. http://prescribewellness.com/solutions/starwellness. Accessed July 12, 2016. Ateb. Pharmacies. 2016. www.ateb.com/pharmacies. Accessed July 12, 2016. Electronic Quality Improvement Platform for Plans & Pharmacies. I am a… pharmacy professional. 2016. www.equipp.org/professional.aspx. Accessed July 12, 2016. Mevesi. Pharmacy solutions. 2016. http://mevesi.com. Accessed July 12, 2016. PioneerRx. Pharmacy software features you are absolutely going to love…. 2015. www.pioneerrx.com. Accessed July 12, 2016. Rx30. Medication therapy management + STAR rating management all in one! 2016. www.rx30.com/experience-rx30/rx30-products/clinical-services. Accessed July 12, 2016. Nau DP. Proportion of days covered (PDC) as a preferred method of measuring medication adherence. 2016. http://ep.yimg.com/ty/cdn/epill/pdcmpr.pdf. Accessed July 12, 2016. Pharmacy Quality Alliance. PQA performance measures. 2016. http://pqaalliance.org/measures/default.asp. Accessed July 22, 2016. Baker D. Evolving quality measures: impact on payers, physicians, pharmacists, and patients. February 12, 2015. www.amcp.org/uploadedFiles/Information_For/Affiliates/Northeast_Region_AMCP/NE%20AMCP%20program_021215_%20Evolving%20Quality%20Measures.pdf. Accessed July 16, 2016. Pharmacy Quality Alliance. Use of high-risk medications in the elderly (HRM). 2016. http://pqaalliance.org/images/uploads/files/HRM_2016.pdf. Accessed October 19, 2016. Pharmacy Quality Alliance. PQA mission and strategic objectives. 2016. http://pqaalliance.org/about/default.asp. Accessed July 14, 2016.